It’s been way too long, but Grey Matter Art is finally releasing a new print in its classic Marvel Origins Screen Print Series by Dave Perillo!!! Created in 1973 by writer Steve Gerber and penciler Val Mayerik, Howard the Duck was featured in a few issues as a secondary character in Man-Thing’s Adventure Into Fear comic book series, before receiving his own comic book, Howard the Duck #1, in 1976. The Blot got to meet Mayerik a few years ago and was such a thrill to hear him tell stories of those early Man-Thing / Howard the Duck days. There has been a few different versions of Howard over the years, but the character has seen a huge resurgence in popularity recently since his brief cameos in both Guardians of the Galaxy live action films. 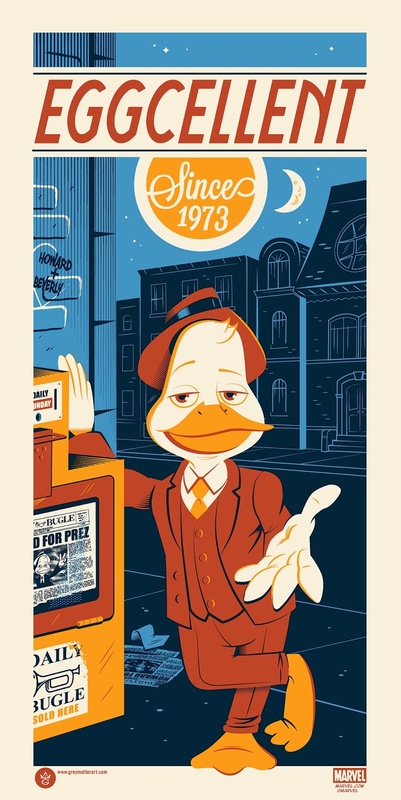 Howard the Duck: Eggcellent Since 1973 by Dave Perillo is a 12”x24” hand numbered Marvel screen print. Limited to just 100 pieces, the poster can be purchased at 1pm EST on Thursday, March 29th, at the Grey Matter Art online store for $35.